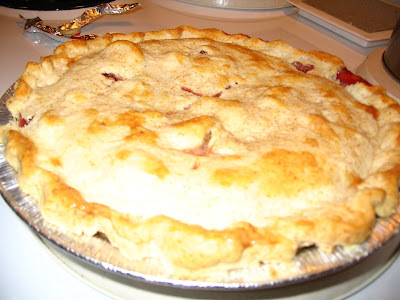 Directions: combine sugar, egg, cornstarch, vanilla together then add strawberry and rhubarb. Let sit for 15 min then add to first pie crust in pan. Place second crust on top and cut slits. Place in oven at 400 degrees for 20min. then glaze the top with egg and bake for 40min at 350 degrees. Jeff and Shelley -- I've been visiting your blog for a little while and just wanted to let you know how much I've enjoyed it. Hope you don't mind me taking a peek now and then into your life. 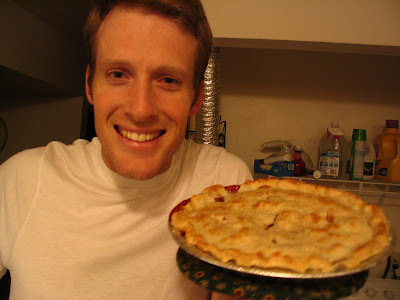 That pie looks very yummy - good job! It was fun seeing you at the reunion last month. You 2 are a very awesome twosome. Oh yea, I wanted to say thanks for introducing me to Colbie Caillat - had never heard of her before seeing your video of her cool song, Bubbly. NOW THAT IS A PIE!! IT LOOK "DELICIOSO" now that we know you can cook... guess what?? we are expecting one!! Hey there Holly...thanks for visiting our site, I'm glad you enjoy it. It sure is fun to be able to share moments of our lives with friends and family so conveniently over the internet. Does anyone in your family have a blog?